Jio TV Goes Big! Jio Launches Its Web Version For A Wider Reach! Jio TV is one of the two leading TV streaming services in the country. In the latest update in the saga of Jio TV’s web version, tech portal Telecom Talk has reported that the Jio TV website was pulled down by jio themselves owing to some ‘Technical Litigation’ issues. They got this information when they reached out to Reliance Jio’s Priority Care Team for clarity on the issue. According to them, it might take anywhere between 3 months to a year for Jio TV’s web version to get back online. It was brought to our attention that Jio TV website is now showing as “Under Construction”. When we checked at 6:00 PM, it was indeed the case. We’ll keep an eye on the situation and update you further. The ultra-affordable high-speed data available nowadays, has completely changed how people consume media. Even people’s tastes have evolved with the wide variety of choices available in online streaming media. Nowadays, streaming is the name of the game! Everywhere you see, people are huddled above the small screens of their smartphones watching streaming videos and movies. So popular is the trend that streaming service providers have now started creating original content in English as well as regional languages for a wider mass appeal. Some of these web series have achieved tremendous popularity. But, not only web-series, another popular streaming content is live TV. Especially cricket matches. People are now watching TV serials online! Two of the leading live TV streaming providers in India right now are Hotstar and Jio TV. Both these apps provide access to high quality streaming of popular TV serials. Jio Cinema, which provides streaming content and movies, is at no. 2 after Hotstar, beating the likes of Netflix, Amazon Prime & Voot TV. 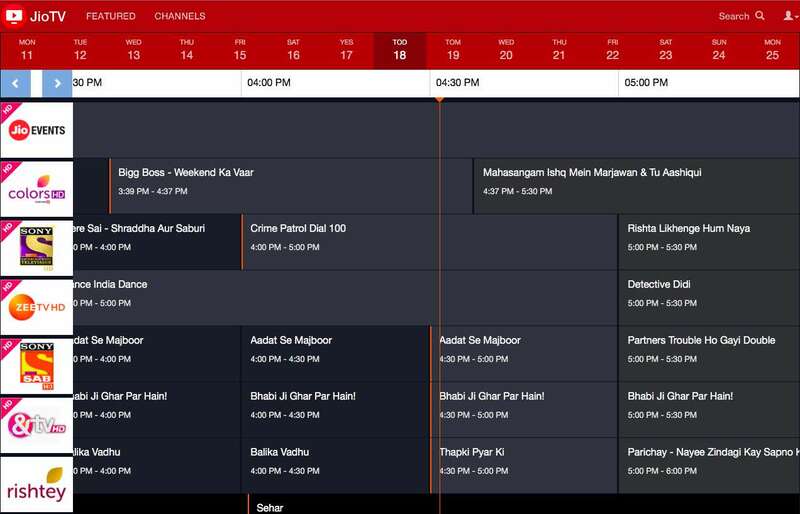 With the web version of the Jio TV, Jio has finally fulfilled a long-standing requests from its customers. They can now log in to https://jiotv.com/ from their laptop or PC’s browser and enjoy live sports events and television serials right there. viewers will be able to access all the channels available in Jio TV’s mobile app. Recently it has emerged that, Jio is already working with multiple content creators to create more original content for its Jio Cinema streaming service. Jio Cinema already has a web version. Now with Jio TV’s web version joining it, Jio has the power of the 1-2 knockout punch to be potentially the no.1 streaming service in India. Jio TV claims to give you access to 400+ TV channels across various languages and genres to suit all tastes. It also offers 60+ HD channels for an enhanced viewing experience. The ‘Catch-Up TV’ feature allows you to watch content from the past seven days. It is worth noting here that you will need to log in with your Jio account in order to view both, Jio Cinema and Jio TV. This means that only those people who have an active JIO SIM will be able to use these online services. This somewhat limits the reach of these services, thereby restricting the viewership numbers. With around 550 channels available, Jio TV is the leading online live TV service provider, leading Airtel TV, Vodafone Play and Idea Movies & TV. It even allows you to switch between HD and SD channels wherever HD channels are available. Also, the layout of the web service is almost similar to the app, which helps with instant recognisability and usability. You can even access the Jio TV and Jio Cinema websites in your mobile’s web browser. Once you are logged in, you can start watching a movie or series on one device and continue watching it on another from where you had previously left off! With so many advantages, who needs a TV when you can watch live TV over your PC or laptop at your convenience! Rs 50 Cr Bitcoin Ponzi Scheme Busted; 600 Shoppers Duped of Rs 50 Lakhs!